In my blog post I thought I would take your through my brain process in how I created an original block. For me this project started with wanting to do something patriotic. 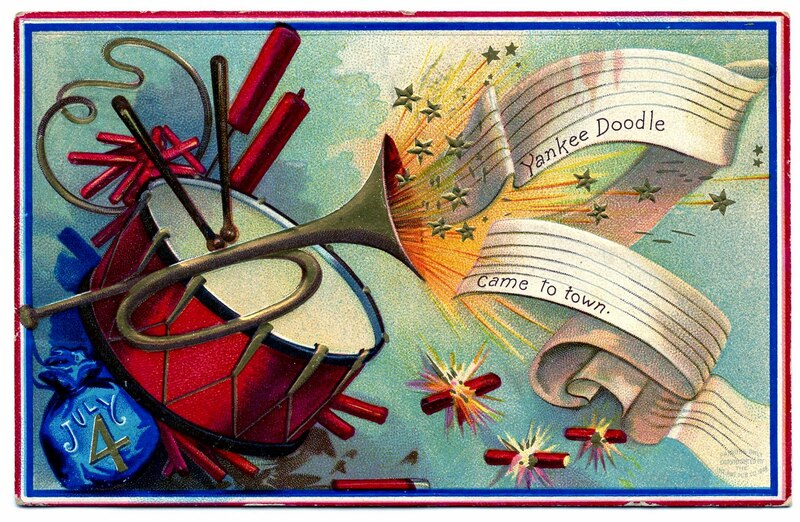 I went to the Graphics Fairy website and found a wonderful vintage Fourth of July image and decided that would be the core element in my yet to be designed quilt. While this is a lovely image, it isn't actually an easy one to work with. In my tutorial this week, I will share will you cropping and resizing the image (so it can be printed on EQ Printable fabric) and then my thoughts on designing a block that used the image plus would be very easy to piece. Next week, I will share with you how I created a quilt (or two) with an "interesting" sized block. Check out some of the creativity that Tech Know Quilters shared this week on the private Facebook group. If you aren't a member, join the Wait List to receive notifications during our next enrollment period. Sign up here. Julie P. Julie finished the top for her bargello quilt from the Bargello Quilt class. Announcement: I have made the decision to close the doors to the Tech Know Quilters membership on Jun 26th to better focus my attention on serving the members within the group. ​After Jun 26th you will only be able to enroll during designated open enrollment periods. Many of you know that when I am not quilting (or working with Electric Quilt) I enjoy frequenting the ice rinks. I am passionate about learning to skate -- almost as much as I am about Electric Quilt. Even though I am not naturally athletic, I love the challenges of learning something new at this stage in my life. Within the skating world, you can measure success through achievement of various milestones. The big milestones require testing in front of US Figuring Skating judges -- which can make a skater very nervous. This process inspired me to create a success path -- without the judges -- that you can use to measure your progress with Electric Quilt 8. Scroll to learn more about each of the five stages along with what Tech Know Quilters classes are the most beneficial at each stage. You purchased EQ8 and are excited (but may also feel overwhelmed) with all the options in this program. You are looking forward to taking advantage of all the program has to offer. Each of us after first purchasing the software find ourselves at this stage. We purchased the software because we knew we were creative, and wanted a way to express that creativity. However after opening the program and seeing all the icons and seeing all the different parts of the program, we may begin to wonder if we made a wise decision. It can be hard to tackle the now daunting prospect of figuring out how to do the simplest tasks. My one month training Shoot for the Stars with EQ8 is geared to those at this stage. It teaches you how to navigate the program and to do some basic quilts using EQ8. If you are interested in learning more, click here. You can purchase Shoot for the Stars with EQ8 here. You have created some basic quilts using EQ8. Most of your designs utilize horizontal and on point layouts along with blocks and fabrics from the libraries. You are itching to tackle drafting blocks using EasyDraw and utilize alternate layouts to highlight your blocks. You are comfortable with navigating the program and using some of the basic features. However, when looking at pictures of quilts you are struggling with figuring out how to recreate the designs in EQ. Through the Tech Know Quilters Private Facebook group and Help Sessions, you can also receive assistance in figuring out how to draft those scary blocks. You are comfortable with EasyDraw settings and tools and are ready to approach more complex blocks that don't work well in EasyDraw. You are also looking to explore more complex settings for these blocks. As you look at quilts in magazines, on Pinterest or at shows, you are more quickly seeing how they can be drawn in Electric Quilt. However you are identifying designs that won't work in EasyDraw or with the standard layouts. You are ready to extend your skills to PolyDraw, Applique and Custom Set. There are a number of classes within the Tech Know Quilters program geared to this stage of development including EasyDraw Kaleidoscopes, Introduction to PolyDraw, Introduction to Applique, Hexagon Blocks and Settings, Optical Illusion Quilts, and T Shirt and Panel Quilts. Each class provides additional insights about mastering this particular stage. You have mastered the EQ8 toolkit and are ready to take your own designs and create original works using EQ8. At this stage, you no longer are satisfied with reproducing someone else's quilt or design. You are ready to begin creating original designs in Electric Quilt. Typically Tech Know Quilters members at this stage are taking the lessons and challenging themselves to create an original design using the concepts from the lesson. They are regularly participating in design challenges within the program. Tech Know Quilters classes at this stage include Working with Fabric Images, Modern Quilts, and Foundation Patterns, T Shirt and Panel Quilts. You have mastered using the design elements in EQ8 and are excited about sharing your love of quilting with others. You are ready to explore different ways of sharing your quilt designs which may include teaching, publishing patterns, entering your quilts made from your designs in shows, or sharing your EQ knowledge with others. During this phase, you are excited when others wish to recreate your original works of art or are asking your for the pattern. You enjoy assisting other Electric Quilt users and quilters in problem solving their designs and quilt projects. You are now focused on how you can best communicate the designs you have created in Electric Quilt. You are recognizing that you may need to supplement your Electric Quilt work and are trying to figure out what other tools would be beneficial. Tech Know Quilter lessons on converting EQ designs to handouts and patterns are useful as you work on developing your pattern writing skills. These lessons will be incorporated into Tech Know Quilters series from Month 7 forward. During July, I will be releasing a complete copy of the Tech Know Quilters Success Path as well as checklists for each stage to all Tech Know Quilters members. I love seeing their work! The new class offering for July will be on Modern Quilts. Check out and join the Tech Know Quilters program before the doors close on Tuesday, June 26, 2018. Click here. This week has found me in production mode for the Tech Know Quilters Modern Quilts class that will be premiering in July. I already had enough blocks and quilts for two classes on the topic, but I decided to check out my local library for other books on the topic. One intriguing concept shared by Victoria Findlay Wolfe was on creating improvisational fabric. As I was reviewing her book, 15 Minutes of Play, I began thinking about how we could simulate improvisational fabric within EQ8. Let me share how I chose to do this in this weeks Electric Quilt video tutorial. Here are the quilts I designed using this concept. Improvisational Fabric Diamond quilt designed by Kari Schell using EQ8. Here are a few of the quilts posted on the Tech Know Quilter's Facebook group this week. The group is mastering PolyDraw with a variety of fun blocks and quilts. In the Tech Know Quilter's Bargello class during May, we explored producing many different types of Bargello blocks and quilts. One quilt that was explored was a modern bargello. Here was the block and quilt I presented to the group for inspiration. I chose this design because the sections in this block would be super easy to strip piece. I am all about quilts that can be easily pieced. I was super excited to see what the Tech Know Quilter members are doing with this particular concept. Some used my block and my quilt -- others branched out to do their own thing. Check out their Modern Bargello designs. I think you will agree that EQ8 can definitely be used for modern quilt design. Aren't these an awesome group of modern quilt designs? And all done with Electric Quilt 8. Are you Ready to Join the Tech Know Quilter Community? No matter what you experience level with Electric Quilt 8 -- we are looking forward to your joining us. We have a new class that started on Friday. Introduction to PolyDraw. Have you been wondering if Electric Quilt 8 is for you? I will be sharing information on EQ8 plus a few of my quilts designed in EQ8 with the Minneapolis Modern Quilt Guild. I've even modified my lecture to talk about how EQ8 can be used for modern quilts. Meeting is June 21 at 7:00 pm at the Textile Center (3000 University Ave SE). Lecture is $5 for those not in the guild.